I love most that first breathe when I step out of the car after a two-hour drive from Portland, OR and inhale the rich smells of Cascade Head. It’s a mixture of the salty ocean with the loamy earth. 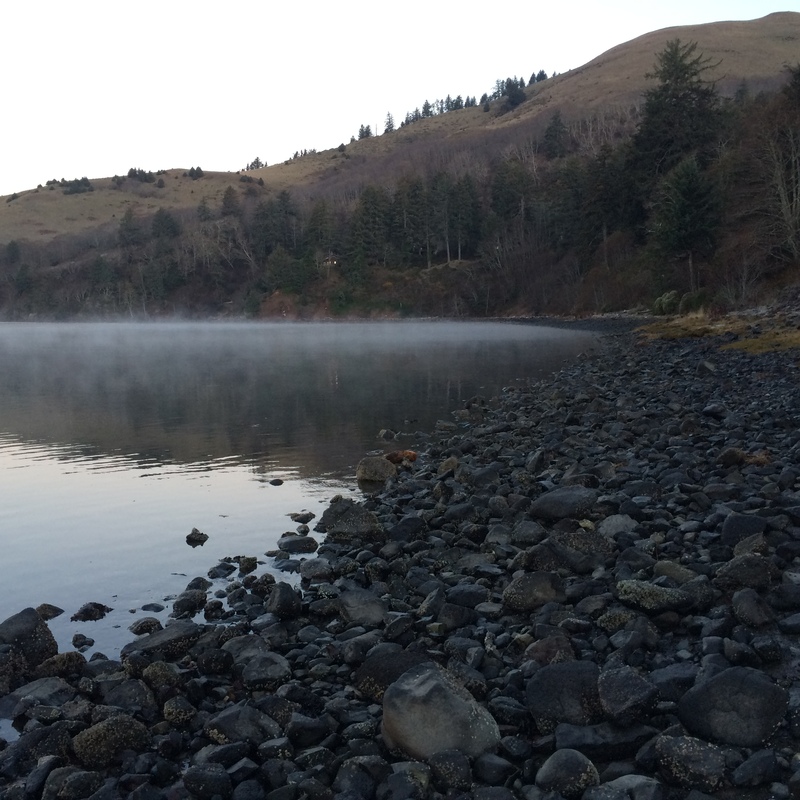 It is specific to this area where the sea meets the land at the mouth of the Salmon River Estuary. As a child I was allowed to roam this River and the nearby forests at my leisure, spending hundreds of hours quietly watching: noticing the green moss, the green ferns, the green leaves, the green pine trees—infinite shades of green teaming with life. Burying my nose in a mossy tree limb made me feel alive and connected to the natural world. It still does! 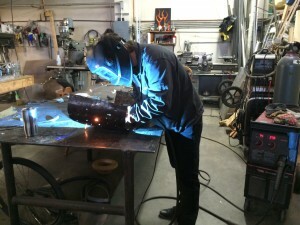 Pacifica is the most personal sculpture I have created thus far. It tells the story of my history, my inspirations, my family, and one of the most powerful forces on earth: the ocean. 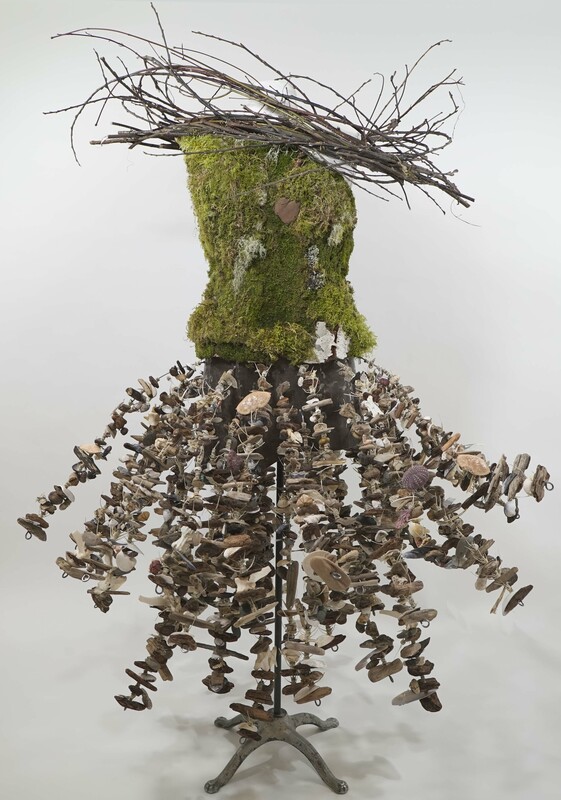 This sculpture was commissioned by The Nature Conservancy in Oregon (TNC) which is celebrating the 50-year anniversary of Cascade Head, one of their prized preserves and a place central to my being. I first came to this magical area as a child in the 1970s when my parents purchased a small piece of property below the majestic Cascade Head which is on the Oregon coast just north of Lincoln City. They settled on a steep triangle of land thick with elderberry bushes and sword ferns over-looking the Salmon River Estuary. Here my Mom and step-father John (who is a painter, sculpture and builder) designed and built our family a beautiful home. John took over 20 years to construct every inch himself down to each drawer and banister. It is truly the gift of a lifetime as my siblings, nieces, nephews, our spouses, friends, and I have returned again and again for over 40 years! 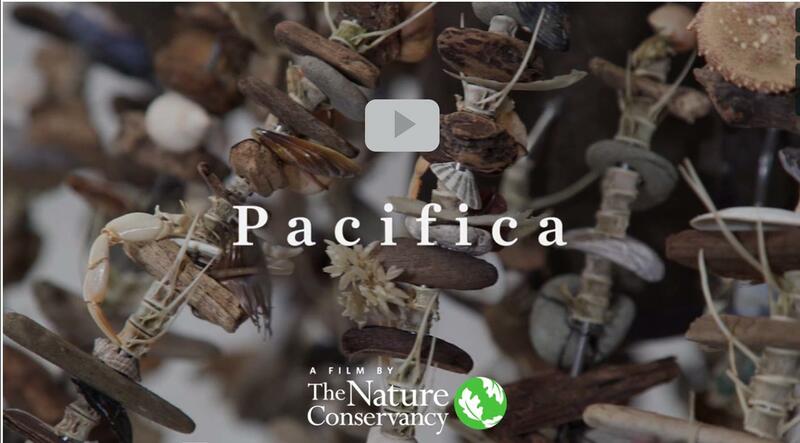 The creation of Pacifica began at Cascade Head on a rainy February day when I hiked with TNC’s Debbie Pickering, Mitch Maxson and Julia Amato, along with cinematographer Brady Holden, up to the Head and walked along the Estuary to collect materials. Debbie, TNC’s Oregon Coast Ecologist, shared information with us about the ecology of the area that was completely new to me despite my years of walking these paths. For example she taught us how to distinguish different conifer trees from one another, and which plants are edible and used for medicinal purposes. Brady Holden’s video about Pacifica won two awards at the McMinnville Short Film Festival in October. 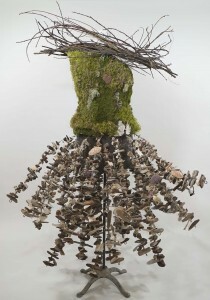 Unlike my other garments, Pacifica is made primarily of natural objects: shells, wood, rocks, bones and feathers are strung on wire and connected to an upcycled steel skirt; the living bodice is made from moss, branches and pine cones sewn to burlap with reclaimed fishing wire. 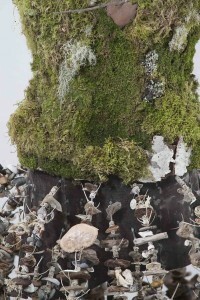 Debbie determined which items we could include on the sculpture, for example we had to be careful not to collect anything with living barnacles attached to it so as not to inadvertently kill any little creatures in creating the piece. 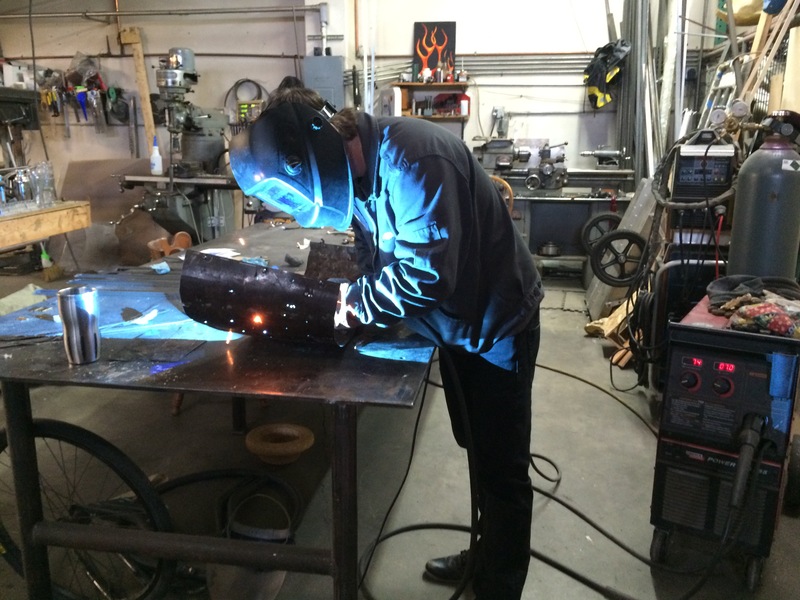 Additionally, Debbie and her husband Dave spent many hours along the sea shore gathering the majority of materials that make up the skirt… I am very appreciative of her special contribution to the creation of Pacifica! For me, this sculpture is about the connection of the ocean to the land. 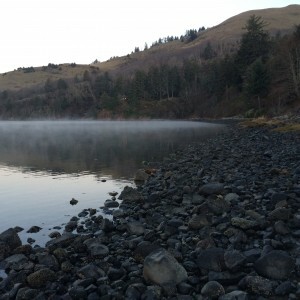 As a child I was moved by the connections and transitions I witnessed at Cascade Head where the river meets the ocean, the ocean meets the land, and that incredible moment when you break out of the sheltered forest into the open grasslands of the Head. There before you stretches the Pacific Ocean out to our neighbors in Asia and, as you turn around, you can see miles of the Salmon River forever flowing, flowing, flowing. Below our house, sitting on a rock in the estuary I watched the waves crashing, splashing, misting, and foaming. Other times the ocean arrives in the estuary quietly, slowly raising the river as the tide flows in, curious seals floating by with big eyes watching me watch them. It was in these moments I discovered my connection with the earth which has guided me to the work I am privileged to do today, and to creating Pacifica. 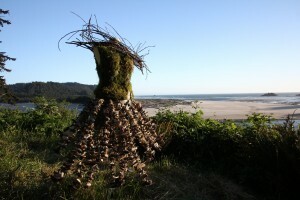 See more beautiful photos of Cascade Head here. 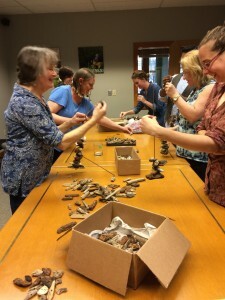 TNC staff and volunteers string the “sea-shore-shish-kabobs”. I started working on Pacifica right after I finished an upcycled wedding dress called Bella. At the same time I was working on Pacifica I was starting another project called PDX Weather Advisory; both had to be completed at the same time in April. All that to say, there is no way I could have finished this sculpture (it took 270 hours) without the help of many volunteers! 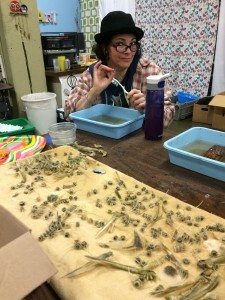 Over 20 people helped me in several work parties at the Oregon TNC headquarters and at SCRAP, a local reuse store in Portland. 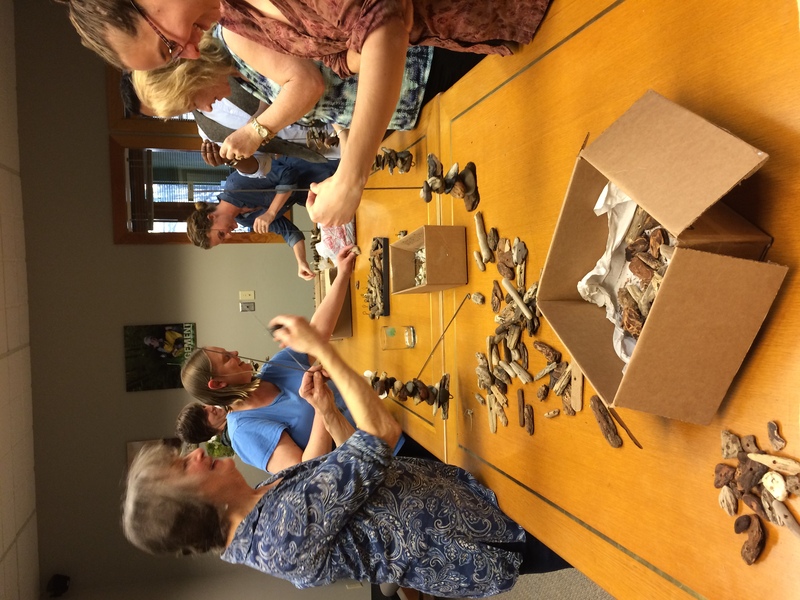 Volunteers prepared materials and helped to string the “sea-shore-shish-kabobs” made of drift wood, shells, rocks and fish bones that make up the skirt. 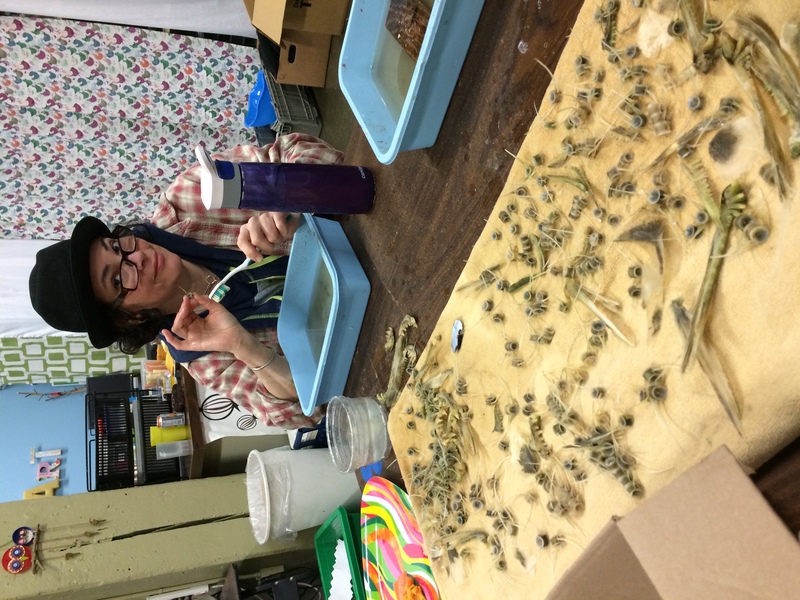 Early in the project the OCEAN volunteered an invaluable gift to Pacifica: a huge pile of old Salmon bones was discovered by a TNC ecologist at another nearby estuary. The teeth, fins and especially vertebra became an essential part of the skirt. The little vertebra created space between the rocks, wood and shells which not only kept the wires from becoming too heavy, but they also helped to extend the materials (which we used ALL of) so that I had enough to complete the skirt. This also created a more open and airy visual feel to the skirt. Pacifica has been on display this summer at the Bridgeport Shopping Center outside of Portland, TNC’s Julia Amato created a beautiful display located in a shop window on the way to the movie theater. In October Pacifica will be showcased at FashioNXT, a celebrated fashion week in Portland, OR. It will travel back down to Salmon River Estuary at the end of October for the 50 year celebration of Cascade Head Preserve, and then in 2017/2018 Pacifica will join the rest of my work in a solo exhibition in the Atlanta Airport for one year. For me Pacifica represents the wisdom of ancient forests regenerating themselves for billions of years. As leaves, shrubs, grasses and trees die and fall to the ground they become food and shelter for other life to grow; at Cascade Head I learned that in nature there is no such thing as waste. Pacifica also captures that sense of discovery the ocean offers as it delivers little gifts along the seashore every day. The sea is so comfortably consistent; for decades and centuries, for most of the life of this planet, the rhythm of the waves has been present like the heartbeat of the earth– the heartbeat of Pacifica. …and anyone else I forgot to mention!! Wow – lovely piece. I love seeing you in the film. Keep on my dear friend. the skirt reminds me of eucalyptus, soft torso, and brush of windy “hair” – so glad you’ve gotten to “home”, Nancy. Lovely work! I am particularly drawn to the rhythm of the skirt. Love the living garment and the stories’ sweep of time. The sense of place is palpable. Brava, Nancy!